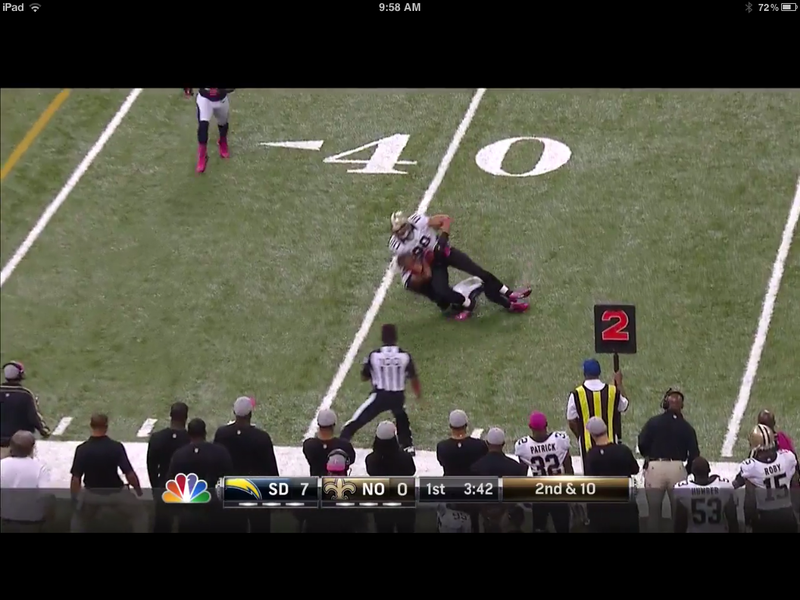 I’m on record arguing that Jimmy Graham’s Week 5 ankle injury was suspicious for a high ankle sprain. Media reports on the injury were sparse last week with the Saints on their bye. Understandably, the story is much bigger this week, with multiple outlets reporting very different things. First, there were rumors posted on Saints’ message boards and Twitter that Graham could be out as long as six weeks. Then, ProFootballTalk posted a story citing a team source saying Graham would play this week. Last night and this morning, Adam Schefter and others are reporting that the team isn’t optimistic that Graham can play this week. What’s a concerned Saints’ fan or fantasy owner of Jimmy Graham to believe? Rather than trusting in media reports and player/coachspeak, believe your own eyes and the laws of physics. That’s overly simplistic of course, but you can often get a very good idea of what a player’s diagnosis by watching the multiple television angles and slow motion high definition replays on your television or computer screen. Don’t misunderstand me. There will be times where the television angles aren’t clear and I’m not advocating that one can be certain of a medical diagnosis without the benefit of multiple medical exams and imaging studies. However, the kinetics of the human body follow the laws of physics. On the sideline, the first question we ask an injured player is “What happened?” — even if we observed the injury clearly ourselves. Many times, the play happened too quickly for the player to know for certain and there are situations where a specific injury mechanism may be associated with multiple possible diagnoses. But knowing the mechanism of injury provides important clues to finding the correct diagnosis. What’s that have to do with Jimmy Graham? High ankle sprains most commonly occur when the foot is forcefully rotated away from the body, stretching and tearing the ligament between the two lower leg bones. Low ankle sprains occur with a very different mechanism, the classic “rolled ankle” where the outside the leg/ankle moves toward the ground. This is a classic mechanism for a high ankle sprain. I think it’s clear that Graham’s mechanism of injury is more consistent with a high ankle sprain than a low ankle sprain. I didn’t examine Graham’s ankle and I haven’t seen his MRI, but that screencap is strong evidence for a high ankle sprain. There’s nothing in the screencap that would inform us of the severity of Graham’s sprain. The replays on Aaron Hernandez looked ugly and he was practicing three weeks after his injury. Graham’s injury didn’t look severe, but that doesn’t mean he’s more likely to return to form in 1-2 weeks than 4-6 weeks. But the screencap strongly suggested that 2-4 weeks was a more reasonable return-to-play estimate that 1-2. The next time you’re not sure whether you’re being misled about a player’s injury by the coaching staff, the media or the player himself, take a look at the mechanism of injury. Players can’t hide their play on tape. Sometimes, they can’t hide the nature of their injury, either. Very solid advice – avoid trying to decipher analyst comments and look at the tape yourself. Dumped Jimmy on the dude with the best record in our league the Tuesday before the madness hit. When players are injured you have to dig deep to find the truth. Coaches want the other team game planning for all their players, so finding another angle on an injury is important. Thanks for the info and the legit heads up news.